A place to get out of the sun, talk about the best finds, and recharge before the next sample (Photo © 2008 Rick Green). This year’s GCBF was blessed with perfect weather. Not surprisingly, both days were completely sold out. I booked early and enjoyed the comfort of Spinnakers for accommodations. After all that imbibing, there’s a lot to be said for having breakfast and a newspaper brought to you each morning. Alternatively, sitting on their deck for brunch with a view is also hard to beat. This year was noteworthy for the presence of a number of American breweries whose Vancouver agents, AFIC EXIM and Beerthirst, have successfully negotiated B.C.’s bureaucratic hurdles to sell product here—Anderson Valley, Brooklyn, Deschutes, Gordon Biersch, Lost Coast, North Coast, Pyramid, and Rogue. While this may spur competition and innovation with local brewers, the preferred outcome would be to expand the market for craft beer. A hallmark of the festival is sampling beer from brewers who don’t even sell here. They come to show their support, enjoy the atmosphere, and experience the Victoria beer scene. We can always count on a visit from our neighbors in Alberta (Wild Rose, WildWood) and Washington (Anacortes, Baron, Boundary Bay, Peaks, Silver City). It’s interesting to see if anyone comes from further afield. This year the ‘brews traveler’ award goes to Bushwakker of Regina and Paddock Wood from Saskatoon. Left to right: Dix brewer Derrick Franche, Christina Willis, Brewery Creek manager Gerry Erith, Adam and Gillian Gile (Photo © 2008 Rick Green). 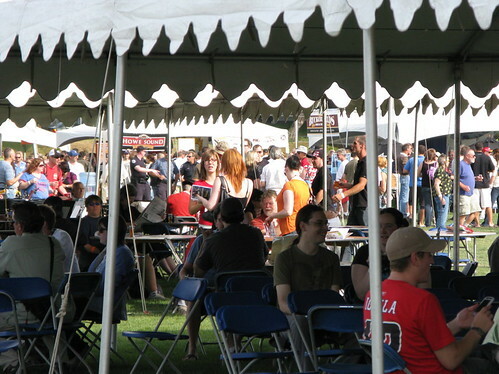 The GCBF may also provide limited seasonal beers, special one-offs, or even test beers. This may be your only chance to ever try them. Central City showcased an intense Maris Otter Imperial IPA and Gary Lohin’s latest iteration of Thor’s Hammer barley wine. Expect the latter to be enjoyed for years to come as Lohin plans to have vintage releases. Sailor Hagar’s is still pouring his Thor’s Hammer from 10 years ago. It has aged beautifully, although they may be serving the last keg of it this December. Crannóg offered casks of Bansidhe Organic Fruit Ale—a base of Munich and Pale malts with a different combination of cherries, crabapples, currants, plums, and Saskatoon berries from their farm in each firkin. If you enjoy fruit beers, you would have wanted to go back to Crannóg’s booth for more than one Bansidhe; every cask was a whole new ballgame. Like Cannery’s Blackberry Porter, it was very popular and sold out early. Howe Sound may add an imperial IPA and an imperial stout to their regular product line. 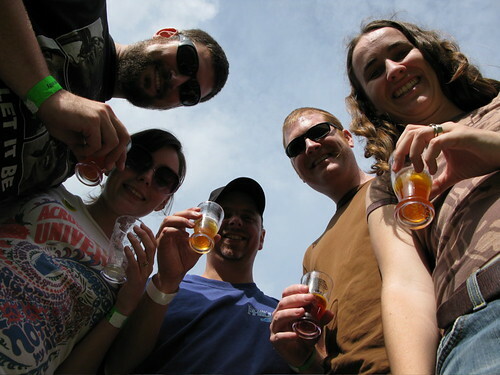 The GCBF was the public’s first opportunity to sample their Total Eclipse of the Hop and Pothole Filler. Owner, Dave Fenn, said the reaction was very positive. Hopefully, then, we can expect to see them coming out in bottles this year. However, given their high octane, you won’t be drinking a 1 litre bottle by yourself. The Vancouver cask ale scene was well-represented by a Mark James Group booth under the banner of Yaletown Brewing. Dix brought a cask of their signature Northwest IPA, Taylor’s Crossing offered an English golden ale that will be on draught at the brewpub, Yaletown had their lambic-inspired Framboise made with several bacterial and yeast cultures, and Whistler Brewhouse proffered their Heart of Darkness imperial stout aged on bourbon-soaked oak. Those who attended the Surrey Summer Cask Festival at Central City will not have forgotten the latter, which was voted the best of show. The organizers should be praised for putting on a quality festival. People were festive without being rowdy, there were decent food options, and musical entertainment ensured a positive atmosphere. For more photos of the GCBF, see my Beer Festivals set at Flickr. Dave Varga, brewer at the Mark James Group’s North Vancouver brewpub, Taylor’s Crossing (formerly Avalon Brewing), is an interesting brewer. On the one hand, he’s a perfectionist in his aim to brew to style. On the other hand, he can go completely off-tangent — last year brewing a cask-conditioned mole stout; this year, coming up with a masala pale ale cask (yes, a curry beer!). His forthcoming beers are a combination of the two approaches. Varga’s next seasonal will be an English Summer Ale (English Golden Ale). Made with Maris Otter Pale malt, some wheat, and a bit of Crystal for colour, the bittering hops were Target and the finishing and dry hops were Amarillo. This will be available as “Alchemy” at booth 31 at the GCBF, but it may be called something else when it goes on tap at Taylor’s Crossing after the Hefeweizen runs out early this month. Due to the persistence of the hop shortage for TC, the focus on most of their remaining seasonals will be on either unique flavours produced from yeast or from different adjuncts. For example, Varga will attempt a fruit beer for this year’s winter seasonal, calling it “Harvest Ale.” He is contemplating using apples, but hasn’t decided on whether to use a Belgian yeast strain or his house ale strain. Normally, Taylor’s Crossing Firkin Fridays mean patrons get to sample a cask-conditioned ale on the first Friday of each month. In October, there will be two casks — a Summer Ale dry-hopped with Hallertau & Saaz and a special Red Truck Lager for Oktoberfest. The latter is an interesting innovation since it is difficult to make a palatable lager in a cask. 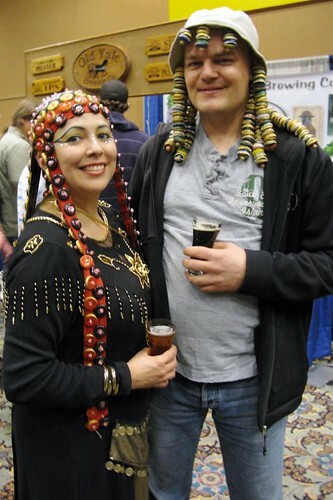 Varga got the inspiration to try this at this year’s Craft Brewers Conference in San Diego. He used ale yeast to recarbonate the beer and added a generous amount of Hallertau and Saaz hops for dry-hopping. By the time it is tapped,it will have lagered for nearly three months. Needless to say, I’ve got some North Vancouver visits planned. Hopefully, Sailor Hagar’s will have Thor’s Hammer the Elder on tap at the same time as TC’s Harvest Ale. That will be a wobbly day!